In a historic decision, the Brahmin Parliament meet in Dhaka yesterday has vowed that it would work tirelessly to unite Hindu society and awaken the Hindu society against the perils of love jihad. 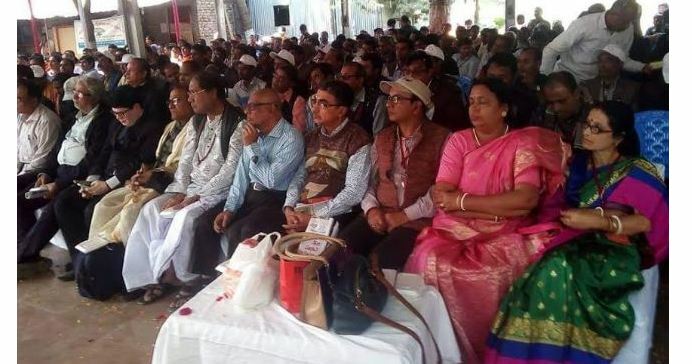 1253 Brahmin delegates from all over Bangladesh joined this conference and said that bringing the Hindu community together was the sole goal for the betterment of the nation and society as a whole. The delegates said that awareness on Hinduism must be increased and for that the community educational system must be oiled well. Brahmin delegates say that since they go to every Hindu house and perform puja and weddings hence, increasing awareness on salient points of Hinduism is going to be their work. A 151-member committee has been formed to oversee the movement. Colonel Niranjan Bhattacharyya is the President and Bijoy Krishna Bhattacharyya is the Secretary-General of this group. Secretary-General of Bangladesh Jatio Hindu Mahajote Gobinda Chandra Pramanik welcomed this noble initiative and praised the delegates for their work for Hinduism in Bangladesh. নচিকেতার ছবি, সহিষ্ণু বাংলাদেশ, অসহিষ্ণু ভারত? Chitra Paul, a human rights activist based in Sweden, has praised the vows of the group and said that the Bengali Hindu society is one of the most egalitarian one there is. She also said that constant intellectual churning will only strengthen and make the Hindu society of Bangladesh a much stronger one and will eventually make Bangladesh the nation that the founding fathers had dreamt of.